We are fortunate to have this very symbolic opportunity to begin the Lenten Season together. We will break bread together in Fellowship Hall at 6 PM. We will embark on the Lenten Season together in worship at 7:30 PM on Ash Wednesday, March 1. This service will include the Imposition of Ashes and the Sacrament of Holy Communion. There’s still time to register for Ivy Chapel United Church of Christ’s Surf Shack Vacation Bible School. We have enjoyed having you in the past and we hope you will be able to join us this year. Also, invite your friends! Fill out this registration form ASAP and return it to Ivy Chapel UCC, 620 N. Woods Mill in Chesterfield. You can also email your completed forms. Questions? Send us an email, contact the church office at (314) 434-4991 or send us a message through our Facebook event. UPDATED: Join us for HarvestFest 2015 Nov. 7! Join us for our biggest fundraiser of the year. Wine and cheese, hors d’oeuvres, desserts and music. Silent and oral auctions… and the ever-popular surprise-packed bubbly bags! The fun kicks off at 6:30 p.m. on Nov. 7, right here at Ivy Chapel – 620 N. Woods Mill Road in Chesterfield. Tickets are $15 per person in advance… and $20 at the door. Proceeds benefit local food pantries and Ivy Chapel programs. 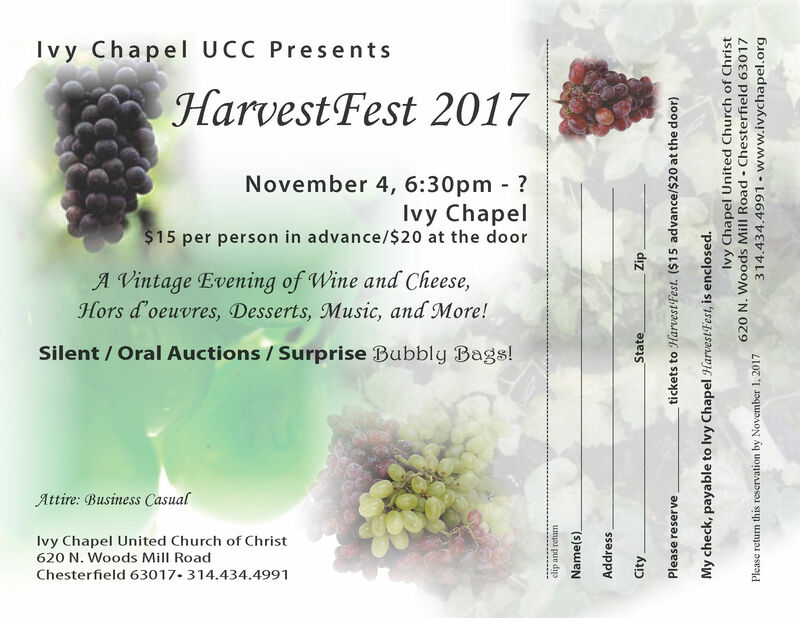 Call 314-434-4991 or contact harvestfest@ivychapel.org with questions. Spread the word! Download and print this flyer and post it on your favorite bulletin board, or forward it to your friends. 2015 Vacation Bible School – Climb to new heights with God! Join us this summer for Ivy Chapel UCC’s Vacation Bible School… Conquering Challenges with God’s Mighty Power. Your kids (ages 3 through completed grade 5) will go on exciting expeditions… reaching new heights from our Base Camp Sing & Play, Glacier Games, Cinema and a Summit Celebration. God has the power to provide. God has the power to comfort. God has the power to forgive. God has the power to love us forever. VBS is 9 a.m. to Noon, July 27-31. The cost is $25 per child. Have you liked Ivy Chapel on Facebook? Visit our special VBS event page, RSVP, and let us know you’re coming.